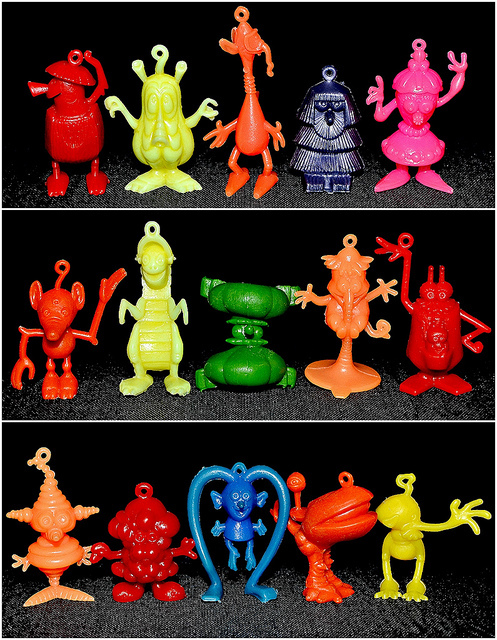 What: Funny Fringes are small (around 1") plastic toy charms of wacky-looking outer space creatures. Offered as toy premiums in cereal boxes, there were 15 different sculpts available, with each character having a unique name ending with "inge" (for a list of all of them, check out this image on my Flickr page). All of the figures have a loop that allows it to be hung on a backpack, belt loop, etc. Having been sold over the course of many years in a few different countries, a wide variety of colors were produced. I haven't been able to find a definitive color guide, but they range from basic primary colors to bright neons. Where: Offered as toy premiums with cereal in at least the U.S., Australia, Mexico. Who: Included with cereal made by Kellogg's, R&L. That pink one in the top row, I've had that for a while now (only in yellow), can't remember where from - but now I know what it is at least. Cheers for that! Cool. Glad this post helped you ID it!